Laser dental treatments are carried out using a concentrated beam of light, which can be used to sterilise areas of infection in the mouth, treat gum disease, reduce gummy smiles, replace the need for drilling to remove decayed parts of the teeth, and for tooth whitening. Research from the American Academy of Periodontology suggests that using lasers as an adjunct to scaling and root planing (SRP) may improve the effectiveness of this procedure. In addition, when lasers are used properly during periodontal therapy, the patient experiences less bleeding, swelling and discomfort during surgery. Each laser has different wavelengths and power levels that are appropriate and safe for different periodontal procedures. USING LASERS REPRESENTS THE LEADING-EDGE TREATMENT TO FIGHT PERIODONTAL DISEASE. 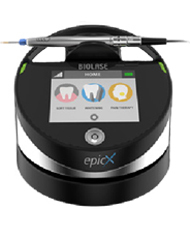 LASERS PROVIDE A REVOLUTIONARY AND PAINLESS OPTION TO KILL HARMFUL ORAL BACTERIA. Reduces the time needed for treatment such as whitening. Dentists in Barkingside, Ilford – Call at barking side dental care in the dental emergency situation to arrange an appointment in Redbridge, Essex.